BOOK - "Sands of Time: The History of Beach Volleyball"
﻿Arthur "Artie" Couvillon is a retired Firefighter that has published over twenty books relating to the Fire Service. Aside from the Fire Service,"Artie’s" greatest interest has been his involvement with the sport of beach volleyball, which began in the early 1960"s. Throughout this period of time, he has accumulated pertinent information, facts, records, stories, anecdotes, and photographs, relating to the sport of beach volleyball. Since retiring from the Fire Service, "Artie" has been focusing on the history of beach volleyball. 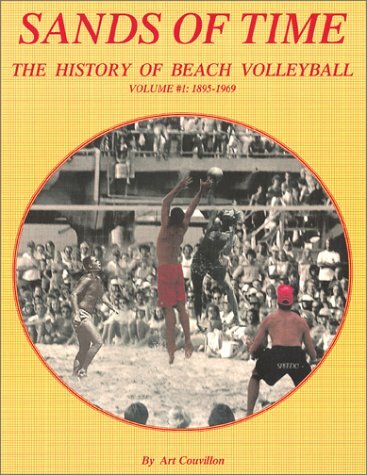 He has utilized all of his resources along with assistance from the fans, players, legends, photographers and followers of beach volleyball, to produce the "Sands of Time" The History Of Beach Volleyball. During his research, "Artie" has accumulated so much information along with an awesome collection of photographs, that he has also produced the "Winners" series. The "Winners" series highlights various players, both men and women. The series includes pertinent information about each "Winner" and covers each of the "Winners" career championship victories, along with numerous photographs of the "Winner" as well as other players of the same era.